November 28, 2018. Sad News We got the following email from Bob Johnson. It has been a while… life has gotten very busy in non-sailing ways. I’m saddened to report that Delphinidae sank in her slip a few weeks ago. The cause hasn’t been determined… there is no hull damage or thru-hull failure. It appears that the very heavy rains we experienced that week (and possibly a partially clogged cockpit drain) may have flooded her and overwhelmed the bilge pump. It’s also possible that someone disconnected the shore power (sad to say, it’s happened), and the batteries may have been exhausted. Heidi Washburn of Cooper Capital Specialty Salvage (860-395-4745, Ext. 204). Delphinidae is currently at Ray Roberts Lake in north Texas (about 60 miles north of both Dallas and Fort Worth). She’s sound, but dirty. 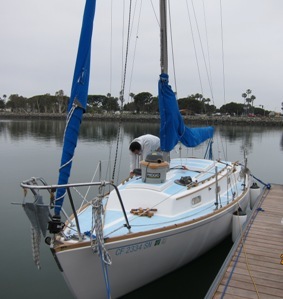 Has a serviceable genny on a roller furler, but her boom and main are missing. She deserves a new caretaker. A side note: the team recovering Delphinidae at first tried to free her from the mud and hoist her to the surface with lines to her bow cleat. Notsomething I would have recommended, but I wasn’t in charge. When everything suddenly let go with a BANG, I envisioned a gaping hole in her foredeck, or worse. When she finally came to the surface… both horns of the cleat had broken off. There must be some pretty stout backing plates in there. I was proud of the old girl. Finally, I was insured by BoatUS. They have been terrific. Hope all is well with you. Best wishes for the holidays. Raise a glass to Delphinidae. March 19, 2011 Bob Johnson (Daisy J) has bought Kevin O'Leary's Delphinidae and is bringing her from San Diego, California to join his ever growing fleet near Dallas,Texas. Thanks Kevin - Delphinidae did well in your care. Here is Bob's email. Well, it's official… I've received the adoption papers, and Delphinidae is ours. We'll be using Daisy J's trailer and heading out to San Diego to bring the new baby home in the next few weeks. Kevin has done a lot of work on her and - from the pictures he's sent me - done a wonderful job. It's a little embarrassing to be the beneficiary of all that effort and expense… says a lot about sailors and Dolphin owners, eh? It's occurred to me that we now have 256 and 265… thank goodness there weren't 700 Dolphins built - we couldn't afford all the permutations! It'll be fun comparing the two sisters and seeing what we find. I'll send some pictures soon. Had it not been for your follow-up with Kevin, and the special offer with which he replied, this wouldn't have happened. We're thrilled, and owe you a big THANKS! I think she has the panache to pull it off. More to follow as we get to know her better. June 2, 2011. 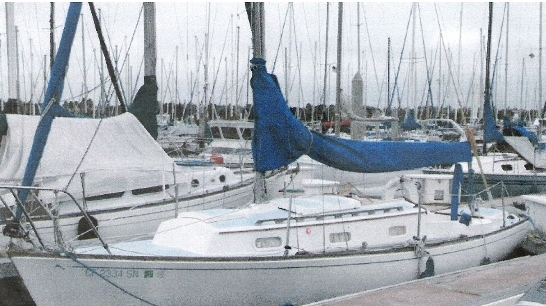 Bob sent in the following update (minor edits), and a heads up that Practical Sailor's June issue has a comparative table that includes the Dolphin 24. 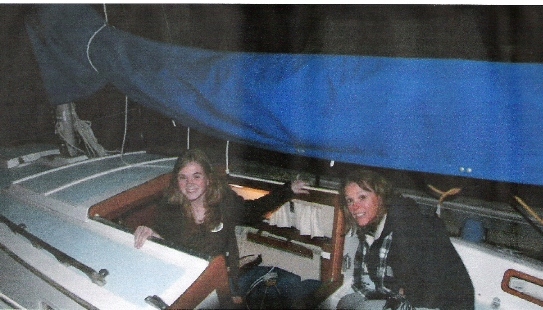 The June issue of Practical Sailor arrived today, and I thought you’d get a kick out of this. The cover story is a review of the Presto 30 – “a modern classic that draws from Munroe’s Presto.” A round-bilge sharpie, carbon wishbone rig, not really my cup of tea. But as is often the case, the article includes a little table with a couple of comparable boats… they entitled it “Presto 30 in Context.” So it compares the Presto 30 to the J/95 and… wait for it… the Dolphin 24. Here in Texas: Delphinidae has been acclimating herself to the lake, and doing fine. Prettiest boat in the marina… it’s not even close. 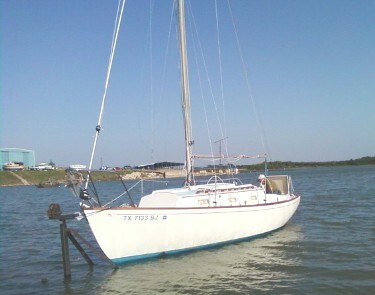 Below left is a a picture of her on launch day (I’ll send more details on the adventure: how we stepped the mast, etc. later), and below right another of her in the marina. She’s the first boat we’ve owned that we’ve kept in a slip. Left the office a little early today, drove home (it’s a 55-mile commute, so it takes a while). Changed, got some dinner… Daisy and I were at the marina by 6:00. On the lake, under sail by 6:10. Sailed two hours, buttoned her up and were home before 9:00. Oh yeah… life is very good. BTW, an interesting discovery. 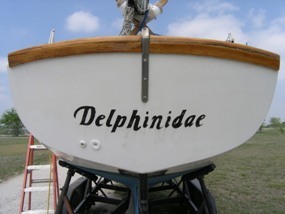 Delphinidae’s mainsail has the Dolphin logo – but it also has a small “24” tucked in under the arching dolphin. I wonder if Pacific was contemplating a bigger sibling? Odd thing for a sail maker to add. These could be the original sails – not sure. I have not noticed that design in any photos of other Dolphins. Will get you a picture when the opportunity presents itself. Take care. Always grateful for the work you do on Dolphin24.org. 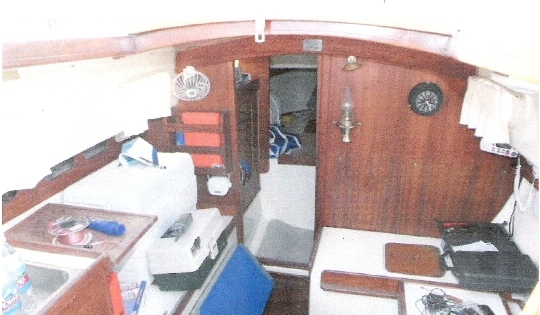 Webmaster Note: We have a direct link on this website to Practical Sailor. It is located, surprisingly, on the Links button on the left of this page. Click on it to go to Practical Sailor's June issue. 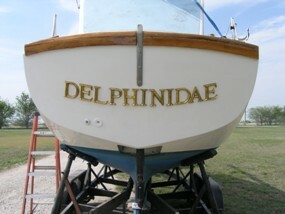 June 4, 2011 - "a Dolphin sighting of a different sort"
Here’s that pic of Delphinidae’s mainsail insignia I promised. Have you seen any others like this? March 6, 2011, Kevin is moving and has to sell Delphinidae. 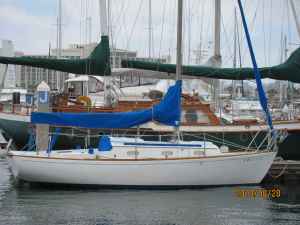 This boat looks in excellent condition and was offered at $4500 on the Craigslist ad - see below. One of our field investigators, Bob Johnson (Daisy J) had brought this to our attention only minutes ago. A quick email to Kevin to confirm brought back this reply. He will sell her for $3000!! to website followers. Here is his email with contact phone #. You are very quick and your investigators are very good. I am moving to Oregon and will also be in Taos. No room for little Delphinidae. I do need to sell her immediately and I will give her to anyone connected with your website for only $3,000 including a brand new Tohatsu 6 hp extra long shaft (which cost me 1500 alone) but I have got to get the boat sold this month. I am in Los Angeles, the boat is in San Diego, and I have just never had the time. Sad. Gracias. Here is the link to the Craigslist ad http://sandiego.craigslist.org/csd/boa/2247885666.html The picture above is from the ad. Kevin checked in with Delphinidae on August 1, 2007, and on January 24, 2008 sent in some of the pictures below. In November Kevin had a weak moment and listed Delphinidae for sale on Craigs List and on this website. Fortunately sanity returned and he has changed his mind. He sent in the following email and couple more photos on December 11, 2008. I couldn't sell my boat. Didn't really want to, deep down. I was down on the boat today. 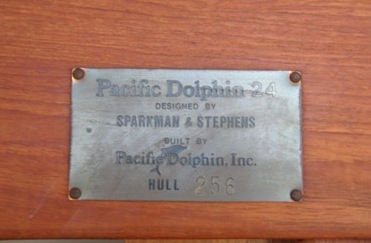 Here is what every sailor in the world wants - an actual Pacific Dolphin official Sparkman & Stephens plaque that is in my boat, hull no. 256. 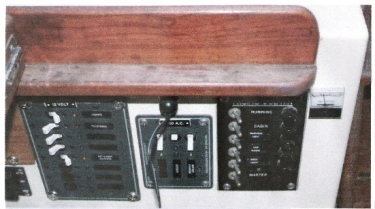 Also is a picture of the original electric panel that I had fixed and upgraded. 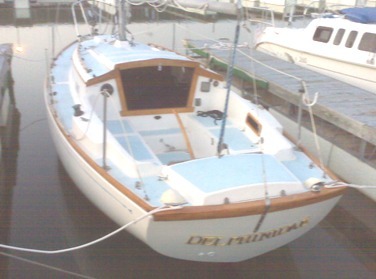 Here are some pictures of Delphinidae, 1976 Pacific Dolphin, Hull 256. 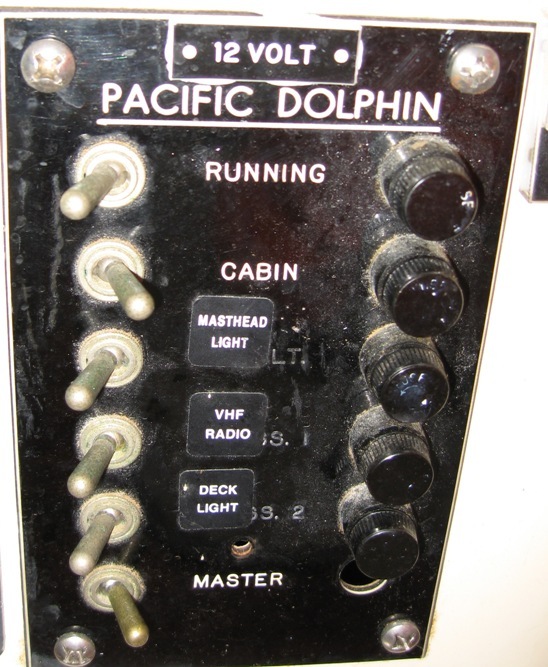 A Dolphin specific 12v electrical panel rew!! This website is "a historical record" of the lives of our Dolphins so the ad Kevin placed for Delphinidae must be saved. However, placing it on Delphinidae's face page might be a too painful reminder of this near miss. We will tuck it away in this link. Click here to go to that ad if you must. September 2, 2010. Delphinidae has some new canvas covers and varnish.